Sept. 20, 2017: NASA-NOAA’s Suomi NPP satellite VIIRS instrument captured this thermal image on Sept. 20, 2017, at 2:12 a.m. EDT (0612 UTC). At the time, Maria’s eye was just east of the American Virgin Islands, and its northwestern quadrant stretched over Puerto Rico. 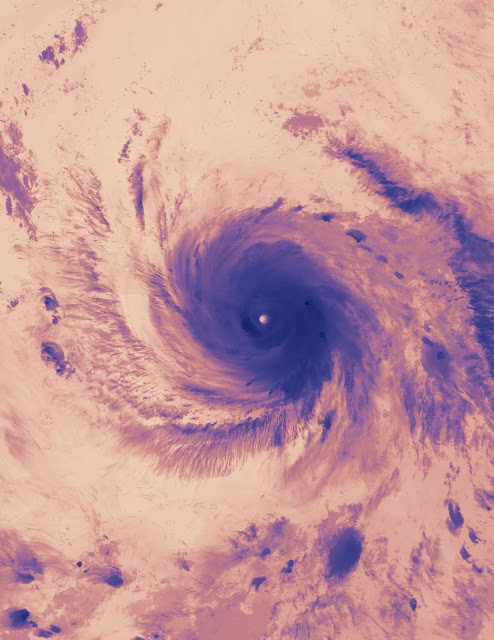 NASA looked into Hurricane Maria and found that powerful convective storms within the hurricane were dropping heavy rainfall. Maria brought that heavy rainfall to Puerto Rico and made landfall on Sept. 20 at 6:15 a.m. EDT. NASA-NOAA’s Suomi NPP satellite VIIRS instrument captured a thermal image on Sept. 20 at 2:12 a.m. EDT (0612 UTC). The image showed very cold cloud top temperatures in the powerful thunderstorms in Maria’s eyewall. At the time, Maria’s eye was just east of the American Virgin Islands, and its northwestern quadrant stretched over Puerto Rico.